So many bloggable things have happened over the last two weeks. At risk of failing the first grade writing workshop checklist on my wall, which includes the question, “Is it a seed story?” (as opposed to a “watermelon story”), I’m just going to list them. The seeds are out of date, so here’s the whole watermelon. I went way downtown, even below Chinatown, which in my mind was always the end of Manhattan. 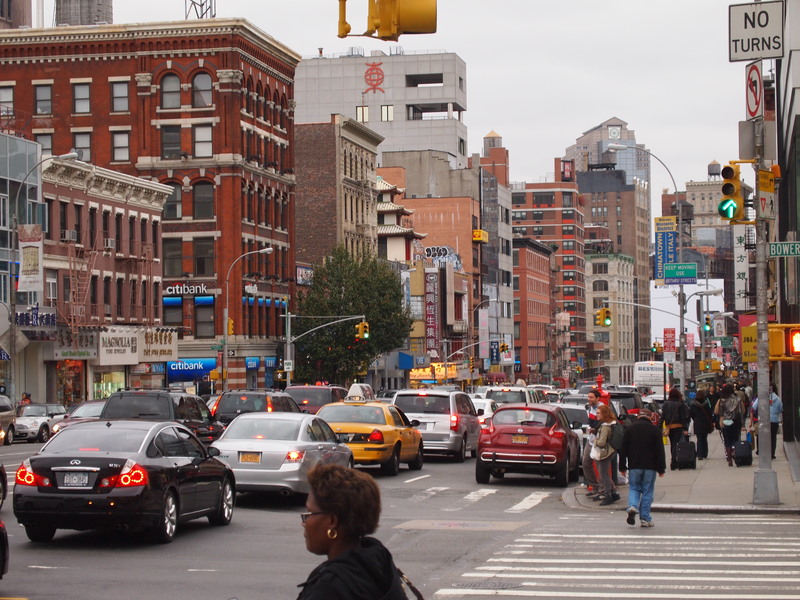 The little pocket of the Lower East Side between the Brooklyn and Manhattan Bridges may have its own neighbourhood name, but “Two Bridges” is one of those in-between neighborhoods, like Hell’s Kitchen or Murray Hill. If they were Australian country towns their claim to fame would be a sign boasting that they’re “the gate-way to…” somewhere else. I spent the afternoon at St Joseph’s church with 72 members of the North American Craco Society (Craco Italy, not Krakow Poland). We celebrated the Feast of San Vincenzo, Craco’s Patron Saint, with mass and then lunch in the basement cafeteria. It’s another story. I hope it will turn into a published one before the year’s out. I left the reunion at 4pm to get into the subway three hours before the MTA was due to shut down in preparation for Hurricane Sandy. 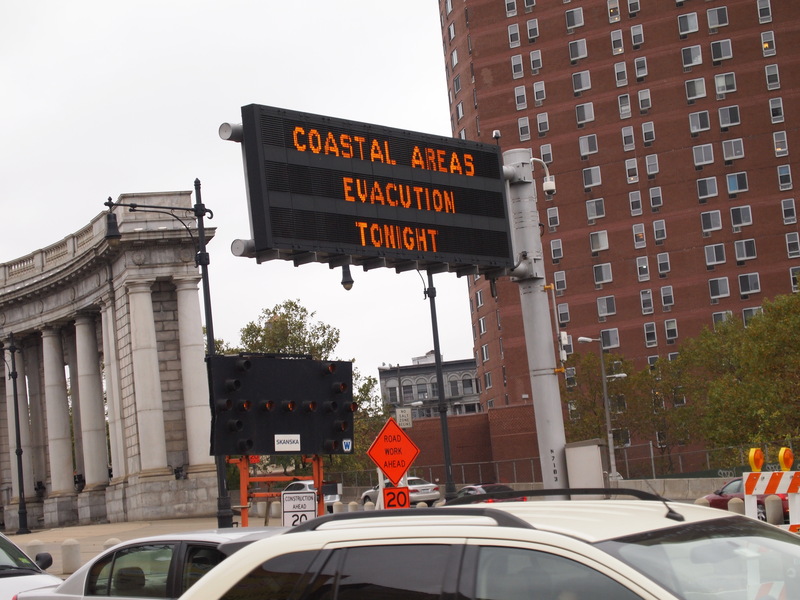 Early evacuation was just taking effect as I crossed the Grand Street exit off Manhattan Bridge. Traffic heading in both directions was snarled and the queue outside the Lucky Star Bus window on the Bowery was snaked around the block. Families sat on suitcases looking nervous, cold or bored and a young couple close to the office window screamed at one another so long and loud their yelling drowned out the traffic noise. The pair stood nose to nose the whole time, spraying each other with shouting and spittle. People in the queue behind them covered one ear and wondered if they should be afraid. Yet somehow – either used to this routine or used to long uncertain waits for transport, accommodation or evacuation – neither one raised a hand once. School was cancelled in case the storm hit while people were commuting. We had a wonderful rainy day at home carving pumpkins and weather-watching. I learned I have to mind my manners, when Ruby said to a relative in Sydney on the phone: “It’s just wind, New Yorkers take these things so seriously,” If I’ve rolled my eyes at what I may or may not have called a propensity for hyper-caution here, I apologize! Cynicism doesn’t suit us. Still at work late in the afternoon, Martin wasn’t taking things at all seriously until he watched a crane collapse two blocks from his office. He came home early after that and we spent the rest of the night watching the storm on TV, occasionally checking on the real thing outside the window. 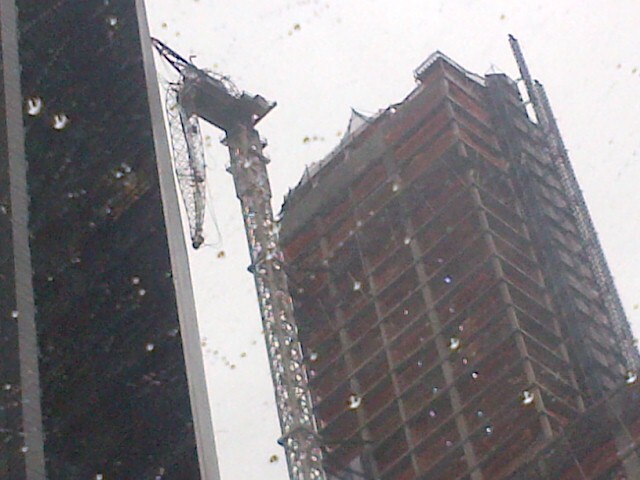 The wind outside was noisy but apart from a chunk of scaffolding flip-flopping down the sidewalk, it wasn’t nearly as dramatic on 85th Street as it was on TV. Everybody uptown awoke to an island that had been cut off at 49th Street. 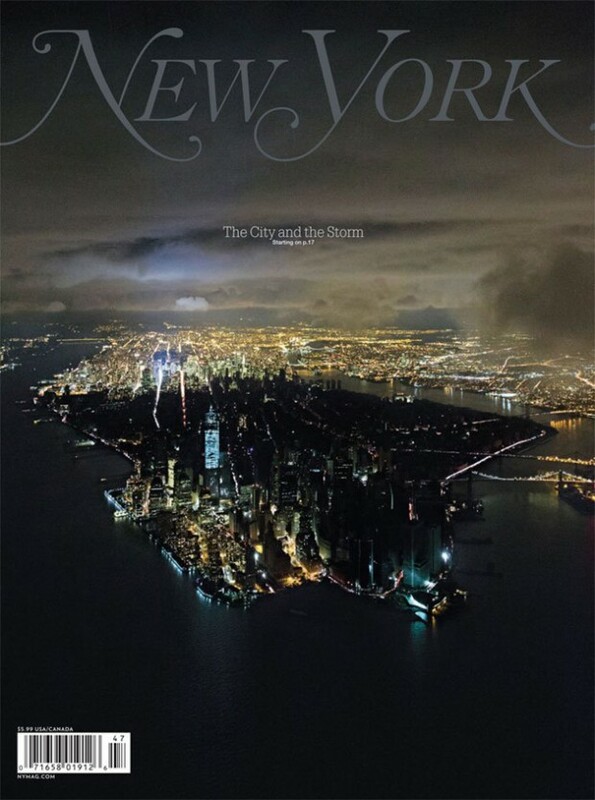 New Jersey, the Rockaways in Brooklyn and Staten Island were awash with debris, sodden and in some places flattened. I wondered if the statue of Craco’s San Vincenzo, lying prone in his box next to the alter at St Joseph’s, was still in tact. I wondered about the guy I accidentally pushed off his stoop when I exited through the church’s (obviously seldom-used) cafeteria door. I hope he found a safe place to sleep in time. Still no school. No subway. Traffic on every corner was gridlocked and every business was short staffed as a result. Those that opened were over-run with “downtown refugees” – up to shower, charge phones, shop and eat. We met a dad and his daughter outside a locked playground and while the children tried to pick the padlock with a stick, then gave up and used the stick/lock-picker to play spies, he said their return home to an apartment near the Chelsea Market was uncertain. 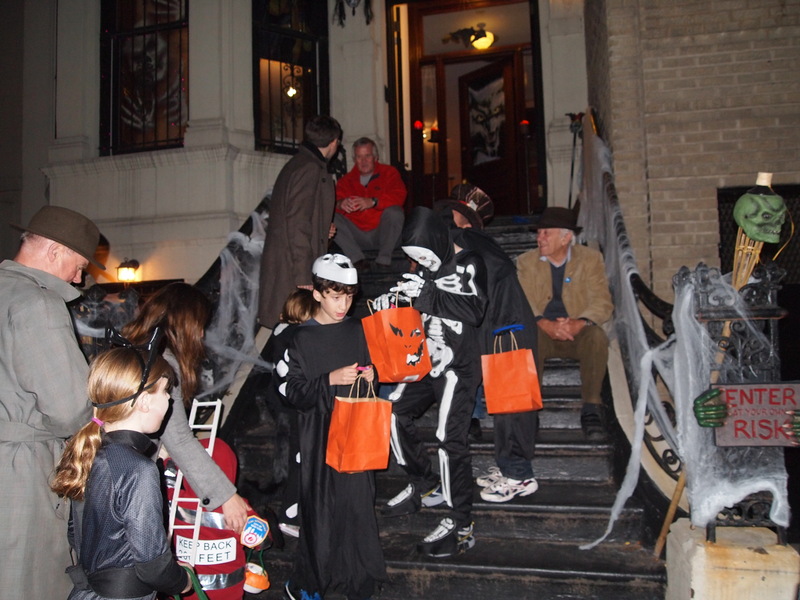 Block Party: trick-or-treating, stoop-to-stoop on 87th Street. The West 87th Street block party still went ahead, thanks to a neighbourhood that had the foresight not to decorate too early. 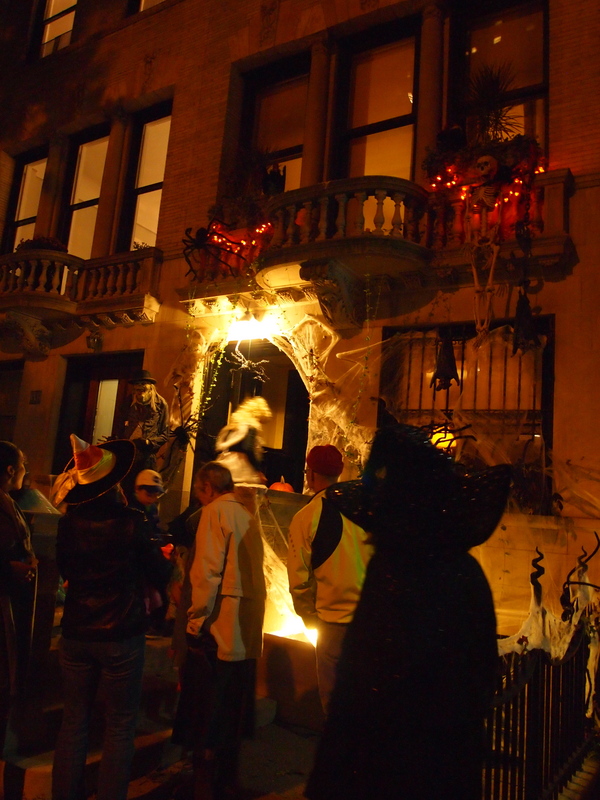 It was a little more subdued than previous year but the spiders, webs and ghosts that climb the brownstones between Riverside and West End Avenues each year were still out in force. Locals still dressed up and socialized on their stoops, dishing out candy to the hundreds of kids who run from step to step. A father and son team had set up a hotplate over their fence and were grilling hot dogs for anyone tired of candy. Their neighbour two doors down offered “spiced wine for the moms?” while his giant St. Bernard dozed next to a cauldron full of candy and kept its owner’s feet warm. 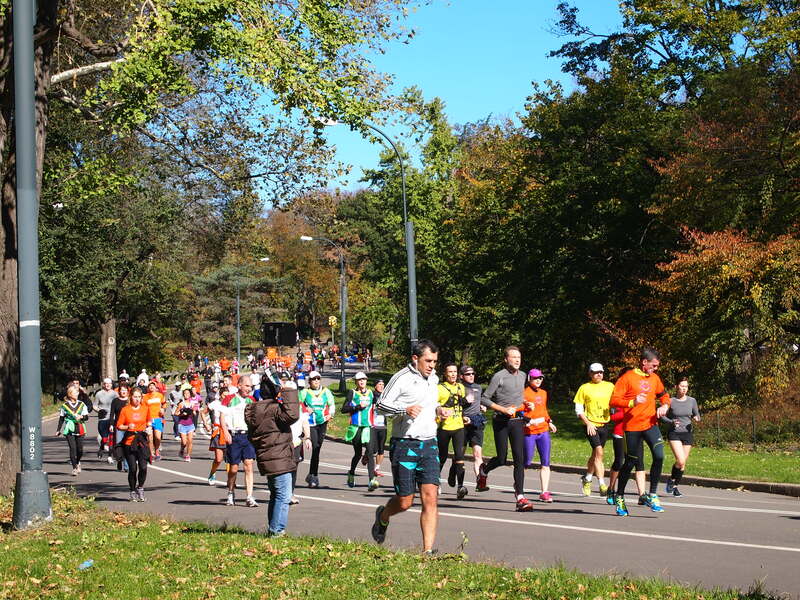 The unofficial marathon: with flights and hotels booked and miles of training behind them, there was nothing stopping runners getting their time in the sun with four laps of central park. I feel for the runners who psyched themselves up to run 26.8 miles. But everyone, runners included, felt for the people on Staten Island who were still chipping away at the debris around their houses. They could really use those generators, space blankets and bottled water earmarked for the marathon route. I didn’t see any animosity from the runners in letters to the editor in the days afterwards. The only real malice came from the New York Post itself, which had launched the campaign to cancel the event in the first place. Poor Bloomberg, he did a good job last week, he willed the Marathon to go ahead but there was no win-win in this one. Two candidates spent $6 billion convincing 57 per cent of the population to vote. Some of those voters spent 40 minutes (in Bloomberg’s New York electorate) to four hours (South Carolina), lining up to use as many different voting systems as there are states. From a the broken voting machines in South Carolina, to a touch-screen system in Pennsylvania that relies on an election official to dip his or her ID card every time someone votes, in order for that person’s vote to be registered (requiring an official to accompany every voter to their ballot?) to a six-page paper and pencil ballot in Florida. My local Fairway Supermarket electoral system seemed entirely reasonable in comparison! 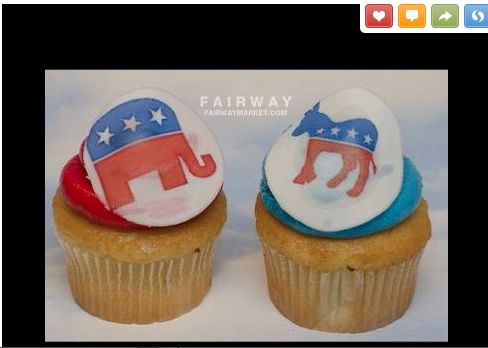 Never mind Ohio: Who won the Fairway Cupcake Election? Republican vs. Democrat cupcakes were sold through Nov. 5 for $1.49 each – buy as many as you like, as many times as you like – citizenship not required!